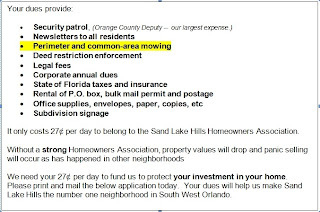 After reading some of the board meeting minutes of Sand Lake Hills, I had come up with a question regarding the subtle difference between a "mandatory" homeowners association and what is knwon as a "mandatory maintenance" homeowners association. As posted on the Sand Lake Hills Lawsuit website, the association discussed the possibilities of becoming a mandatory association a few years back, but were faced with a problem. While they wanted to make every homeowner a member, they did not believe they could get enough votes - 100% - so, they decided to go for the next best thing. Their lawyer suggested something called a "mandatory maintenance" association, where not everybody becomes a member but everybody pays for the maintenance of the common areas. For a HOA, that would sound like the perfect solution, but only one problem exists for Sand Lake Hills - they have no common property to maintain. As a homeowner who is unfamiliar with the association, or what is and is not common property, one would possibly believe the association does have common property. 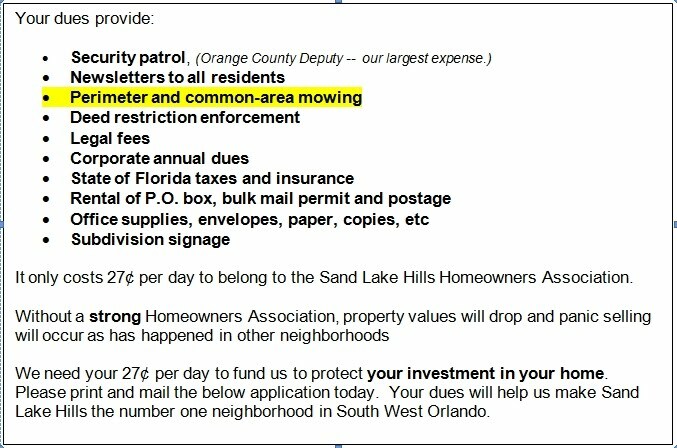 Just consider their application, which states that membership dues will go towards "common-area mowing," and their amended and restated covenants, which contain a section under Article IV titled "Section 1. Common Area," but when you consider the facts that the SLHHOA owns no property, then this section kind of appears to misrepresent the association, and it is believed that the association intended for it to do just that so they can get every homeowner's money. 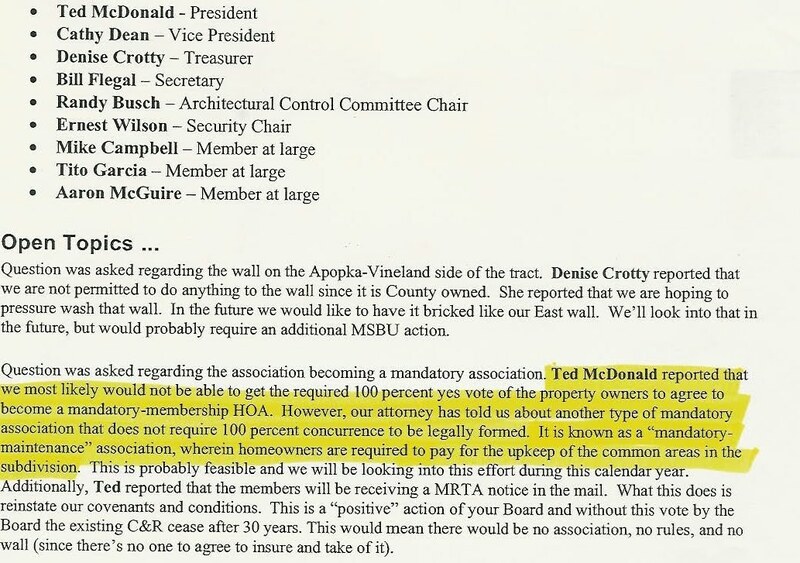 In April 30th, 2005, during the board meeting, at the beginning of the campaign to create a mandatory association, the president of the association, Ted McDonald, acknowledged that they "don't have any common areas" but later, in August of that same year, McDonald seemed to forgot his past admission and stated that there would be an assessment for common area upkeep. Another point of interest is that during that meeting, McDonald renamed their the wording surrounding their campaign to force everybody into paying from "mandatory association" to "fair share community" because he believed it to be more "marketable." So what exactly is the difference between a "mandatory" and a "mandatory maintenance" association? From my understanding, one calls the people they get their money from a "member," while the other does not, but what do Florida statutes say about the definition of a "member?" "Member" means a member of an association, and may include, but is not limited to, a parcel owner or an association representing parcel owners or a combination thereof, and includes any person or entity obligated by the governing documents to pay an assessment or amenity fee. Now if you consider the language found in the amended and restated covenants, they state that an assessment "shall be the personal obligation of the person or persons who is/are the owner of the Lot," so by the definition of assessments in the rewritten covenants and the definition of membership in the Florida statutes, I would have to say that there is no difference between Sand Lake Hills' "mandatory maintenance" association and a "mandatory" one, and Ted McDonald's lawyer should understand this, right? After all, Ted McDonald said himself that they needed 100% of the people to become mandatory. 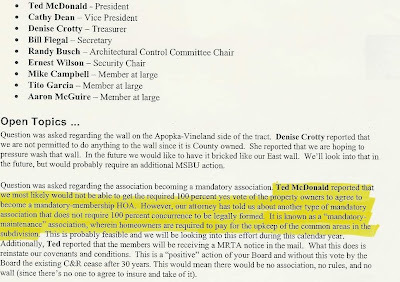 This revelation is interesting because with a mere 51% of the homeowners of various sections approving to the association's rewrite of their original covenants and restrictions, the SLHHOA filed their new governing documents with the county and have been vigorously trying to enforce their documents on the non-member homeowners, threatening legal action should these individuals should not pay their corporation. You have a really good point about the "manintenance fees." This was such a useful article for me. I definitely will look to find out more about these laws. Thanks!